﻿It was by sheer chance. A business colleague and I were discussing a possible channel partnership agreement while having drinks at a Jazz club in West London. When it was my turn to refresh our drinks, I bumped into a friendly Ethiopian lady visiting family from Singapore. 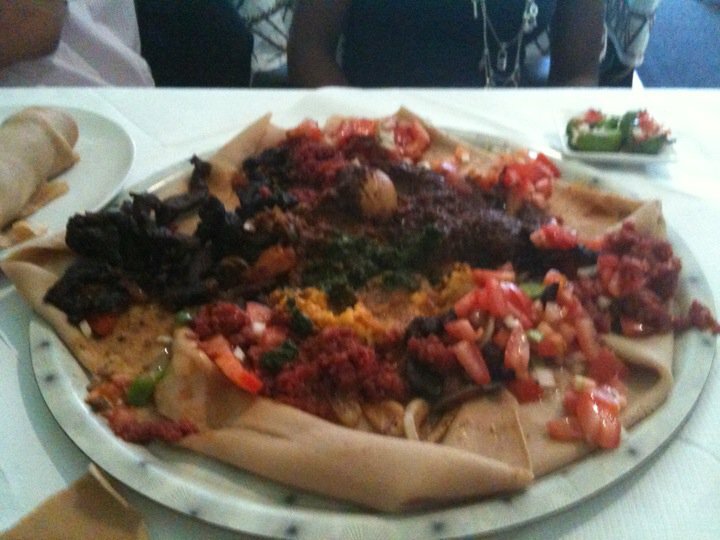 Both my business colleague and I knew a little bit about Ethiopian food, which seemed to flatter her. She appreciated that we knew anything about her culture. Notice chili in the corner. Hot. That was a couple of nights ago. Tonight, Ed Kim, who runs Intrepid’s Vietnam practice and happen to be visiting the London office; Don Miller, a friend from Seattle who has been working in London since February; and I just finished an amazing Ethiopian dinner. This kind lady, her beautiful 8-year-old daughter, along with her London friend took us to a bustling restaurant in Shepherd Bush. While we all had experienced Ethiopian food before, our hostess ordered dishes unfamiliar to us. The raw meats with diced tomatoes was something new for me and fantastic. The chili pepper stuffed with onions and tomatoes was extremely spicy, stopping me right after one bite. During the evening, we were also taught several things about eating Ethiopian food, such as the proper way to unroll the injera bread. The young daughter mocked us for pinching our food up with just three fingers rather than the “four-finger” scoop. For entertainment, the adorable daughter whose father is Swedish, made all of us laugh, usually at my expense, which delighted Don and Ed a little too much. I watched Ed and Don laugh throughout the night. Being on the road does have its rewards at times, but most of it is a grind of working long hours and eating restaurant foods alone. By the end of the evening, this lady and her friend said that after just one meal together, it seems as we’ve been friends for years. They promised the next Ethiopian meal will be home cooked. They were so warm toward us. Most opportunities in life are given to those who are looking for something different, and to those who open themselves up for new experiences. Usually that means being open to other people, especially to those who are different from us. In this situation, I’m glad we met people who had such a mindset when they met us. Posted in People & Culture, Travel and tagged Business travel, Ethiopian food, Travel. Bookmark the permalink. I really loved it and I thank you very much for your kind words!!! I am going to forward it to Miriam. Making Excuses for Your Management Team?